Cut Your Bike’s Weight: Do You REALLY Need Two Kidneys? Ron has a bike blog, The Cozy Beehive, with a different perspective. He’s a mechanical engineer who brings his profession to his cycling passion. I read him every day. He tells you the science behind the sport. I have a brother and a son who are becoming weight wienies obsessed with removing as much weight as possible from themselves and their bikes. Son Matt just shaved his beard off and Jan Norris documented his shaved legs. Bro Mark has been known to empty his water bottle before beginning a climb. Yep, both the internal AND external tanks. The destination of the ideal weightweenie is not a quest for the philosopher’s stone, as some of our purist brothers and sisters will have us believe. To live and act the purposeful climber’s life, we must look to our inner selves. Literally. There are multiple avenues to buy power. We do not see. Look to your inner self, yes inner self. Fat is our enemy, and duplicated body parts superfluous. 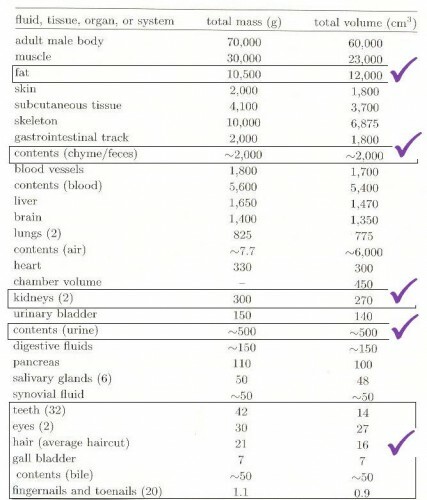 Look at this table he’s put together to show how much weight you could save if you got rid of that extra kidney and eye. Even teeth, hair and fingernails add weight that slows you down. They’ve got to go. CategoriesCycling Food and Nutrition, You Ran Over What? A friend plans to hike the Appalchian Trail. Long-distance hikers cut toothbrushes in half to save weight. Maybe I should suggest surgery instead. Sure. If they ditch the teeth, that saves 42 grams and means they won’t have to carry ANY toothbrush or tooth paste. At least without teeth I would be able to sound out a horrible slurry-ish laugh as I turned my head towards you as I crested the hill and looking back down at you and your mutli-ton bike sitting on the side of the road making that wheezing noise while you wait for your heart rate to correct itself. And as I was considering buying some lighter faster racing wheels for my Madone 5.5, and since we are blood brothers and you don’t see weight as a nemesis perhaps a nephrectomy is in order and you would like to have THREE kidneys to lug around up a hill with you next time? Just think, you could drink even more water and not have to stop and get rid of that water as often as you do now. Let the bidding begin…. That’s not a bad idea. You never know when someone along the trail needs a transplant. I could just whip out my portable operating room on wheels and do the installation before riding off into the sunset. “Who was that masked man?” I’ll hear them ask as I pedal away.